Will the UK retain the neonicotinoid moratorium post-Brexit? Are crops being devastated without neonicotinoid protection? Monarch butterflies; A&E conservation not the way forwards? Neonicotinoids and bees; what is the fuss all about? There have been a number of scientific papers published in recent years discussing the possibility of building miniature flying robots to replace bees and pollinate crops. Clumsy prototypes have been tested, and seem to crudely work. If crops could be pollinated this way, farmers wouldn’t have to worry about harming bees with their insecticides. With wild bee populations in decline, perhaps these tiny robots are the answer? While I can see the intellectual interest in trying to create robotic bees, I would argue that it is exceedingly unlikely that we could ever produce something as cheap or as effective as bees themselves. Bees have been around and pollinating flowers for more than 120 million years; they have evolved to become very good at it. It is remarkable hubris to think that we can improve on that. Consider just the numbers; there are roughly 80 million honeybee hives in the world, each containing perhaps 40,000 bees through the spring and summer. That adds up to 3.2 trillion bees. They feed themselves for free, breed for free, and even give us honey as a bonus. What would the cost be of replacing them with robots? Even if the robots could be built, complete with power pack and control devices, for one penny each (which seems absurdly optimistic) it would cost £32 billion to build them. And how long would they last? Some would malfunction, some would get caught out in the rain, some would be damaged by wind or spiders’ webs. If we very optimistically calculate the lifespan at one year, that means spending £32 billion every year (and continually littering the environment with trillions of tiny robots, unless they could be made biodegradable). What about the environmental costs of manufacture? What resources would they require, what carbon footprint would they have? Real bees avoid all of these issues; they are self-replicating, self-powering, and essentially carbon neutral. Thus far I have glossed over a vital further point. Pollination is not all done by honeybees. Numerous other insects pollinate crops and wildflowers, including butterflies, beetles, moths, flies, wasps and many more. These come in all sorts of different shapes and sizes suited to different flowers. Honeybees contribute at best 1/3 of crop pollination, averaged across crops. So we wouldn’t just need to replace the 3.2 trillion honeybees. We’d also need to replace countless trillions of other insects. All to replace creatures that currently deliver pollination for free. Declines of bees are symptomatic of larger issues. It is not just bees that are declining; almost all wildlife is declining in the face of massive habitat loss and pollution across the globe. 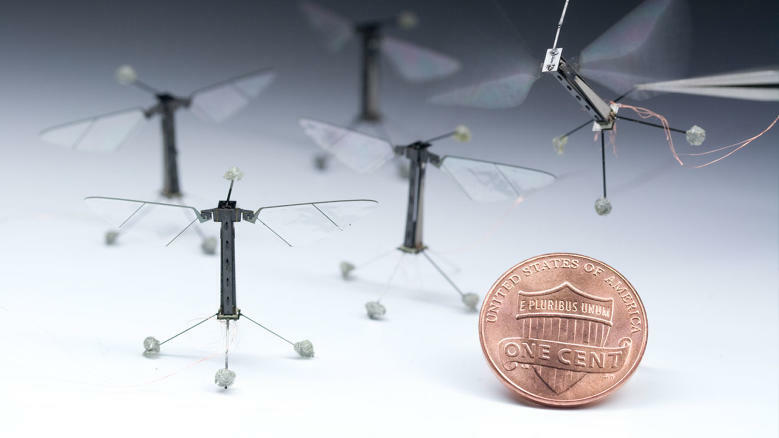 Even supposing we could create robot bees cheaply enough for it to be viable, should we? If farmers no longer need to worry about harming bees they could perhaps spray more pesticides, but there are many other beneficial creatures that live in farmland that would be harmed; ladybirds, hoverflies and wasps that attack crop pests, worms, dung beetles and millipedes that help recycle nutrients and keep the soil healthy, and many more. Are we going to make robotic worms and ladybirds too? What kind of world would we end up with? Do we have to always look for a technical solution to the problems that we create, when a simple, natural solution is staring us in the face? We have wonderfully efficient pollinators already, let’s look after them, not plan for their demise.